“We are not willing to enter into a war with our brothers or with anyone,” the president said during the opening of a number of development projects. Egypt “does not conspire and does not interfere in the affairs of others,” the president added in comments that stressed Cairo is pursuing stability in the Horn of Africa. “Our spending on the Armed Forces is to achieve Egyptian national security in accordance with security concepts that require a military capability to protect Egyptians and preserve peace,” he said. 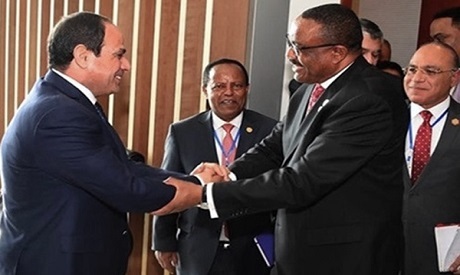 El-Sisi’s comments came against a backdrop of growing speculation in Ethiopia and Sudan over the possibility of Egypt waging military action from the UAE-owned base in neighbouring Eritrea as negotiations over Ethiopia’s Grand Renaissance Dam remain deadlocked. Sudan, which two weeks ago summoned its ambassador from Cairo for consultations, went so far as to announce that its troops are combat ready. Tensions have been rising between Cairo and Khartoum over Egypt's southern Halayeb Triangle region, over which Sudan claims sovereignty. Eriterian President Isaias Afwerki said on Monday that there are no Egyptian troops in his country. Prime Minister of Ethiopia Hailemariam Desalegn arrived in Cairo on 17 January for a two-day visit. Desalegn is heading his country's delegation to the sixth meeting of the joint Egyptian-Ethiopian Higher Committee. The last meeting of the committee was held three years ago. An informed government source says that Egypt needs a firm commitment from Desalegn on three issues: that Ethiopia will not begin filling the dam’s reservoir without Cairo’s consent; that the filling timetable be fixed following discussions by the technical teams and will not compromise Egypt’s share of Nile water; and that Addis Ababa commit to cooperating “in good faith and transparently” with the consultants contracted to advise Ethiopia, Sudan and Egypt on the impact of the dam. Egypt, Ethiopia and Sudan have been trying to negotiate an agreement on the construction and filling of the Grand Ethiopian Renaissance Dam since 2015. Construction work has continued apace, though no agreement has been reached. Following a new round of talks between the three countries in November, Egypt announced that negotiations had failed. Days later, in a statement before parliament, Ethiopia’s ambassador to Egypt insisted his country remained committed to a negotiated solution that satisfies all parties. During talks with senior Ethiopian officials in Addis Ababa in late December, Egyptian Foreign Minister Sameh Shoukri suggested a team of experts from the World Bank join the negotiations to provide unbiased advice on the safety of the dam and its possible impacts. “The idea was to have an independent international body assess the process of filling the reservoir,” says a senior government official. He added that previous studies conducted by the World Bank “before Ethiopia began construction” concluded that the dam might harm Egypt’s water interests unless its construction and the filling of the reservoir were carefully calibrated. Neither Ethiopia nor Sudan welcomed Egypt’s request that the World Bank be included in negotiations. According to the Egyptian official, it is likely they will either refuse or take a very long time before agreeing. “This is an ongoing problem. Ethiopia, with the support of Sudan, has been wasting time in fruitless talks while aggressively pursuing construction of the dam to create new facts on the ground,” says the official. Today, Cairo officials say it may well be time for Egypt to reconsider its commitment to the Khartoum Declaration of Principles, signed by the leaders of the three countries in 2015, which established the protocols for the tripartite talks. “This is not something we will rush into, but it has to be considered given Ethiopia’s refusal to make serious commitments. The fact is we have had enough of endless promises that lead to nothing,” says the official. In an interview with Al-Ahram Weekly published last month, Aye Atske-Selassie Amde, Ethiopia’s ambassador to Egypt, said the political will of leaders could help give a positive push to negotiations, but in the end it will be up to technical experts to resolve outstanding issues. As it is, Egypt’s annual 55 billion cubic metre share falls short of meeting the water needs of a growing population. The amount was set in historic agreements which a majority of the Nile Basin’s 10 countries do not recognise because they were signed during the colonial period and want renegotiated, something Cairo firmly rejects. Desalegn’s two-day visit has been officially designed to allow for him and El-Sisi to chair a meeting of the joint cooperation committee that Egypt and Ethiopia established in 2014. The committee could discuss a wide range of cooperative ventures between the two countries, including possible agrarian, energy and industrial projects. Diplomats on both sides say the two countries are more than willing to widen joint cooperation in the hope this will help build confidence. In parallel with talks with Ethiopia, Cairo is considering ways to contain tensions with Sudan, over both the dam and the Halayeb Triangle dispute, say informed diplomatic sources. Egyptian officials say Cairo is still considering its options and is keeping a close eye on the alliances the regime of Sudanese President Omar Al-Bashir is forging with Turkey and Qatar. “We don’t want to be in a state of perpetual tension with Sudan, though Khartoum needs to realise we are disappointed with some of its choices,” said one Egyptian official.